At large research universities, foundational STEM courses are taught to hundreds or even thousands of students every term. Too often, the outcomes of these courses disappoint everyone involved. To address this problem in a new way, we are launching a new STEM education collaboration called SEISMIC. This project will draw together individuals committed to STEM reform from ten large research universities, including the University of California, Santa Barbara. Participants will connect through parallel data analyses and data sharing, coordinated experiments, continuous exchange of speakers and graduate student researchers, and extended annual meetings. 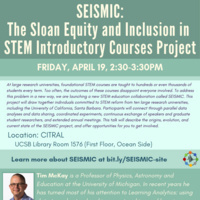 This talk will describe the origins, evolution, and current state of the SEISMIC project, and offer opportunities for you to get involved. Tim McKay is a Professor of Physics, Astronomy and Education at the University of Michigan. In recent years he has turned most of his attention to Learning Analytics: using data to understand and improve teaching and learning.